With a Maratha spirit to battle it out in the Pro Kabaddi League, the Puneri Paltan team is the official team of Pune. The team has been part of the Pro Kabaddi league since the inception of the league in 2014. Since then, the Puneri Paltan team players have performed consistently and have garnered the respect of their opponents. With their unmatched grit and determination, this is one team to follow closely. The great Marathas of yore were famous for their strategic sneak attacks, and viewers get to witness a modern-day version of similar strategic attacks when watching the skilled 2018 Puneri Paltan team players at Pro Kabbadi matches. Masters of the Do or Die raids, the team has steadily moved up the leaderboard and with the current Puneri Paltan 2018 lineup, they seem to be headed for a promising finish. Here are some insights into what makes Puneri Paltan a team to watch out for in the Pro Kabbadi League. The team has played 85 matches in the Pro Kabaddi League. They have won 35 wins, 43 losses and 7 draws till date. They have reached playoffs for three seasons in a row and this is sure to boost their morale to push for better results. The four-thousand capacity Shree Shiv Chhatrapati Sports Complex at Balewadi, Pune is the home ground of the team. Girish Ernak leads the team as captain for Pro Kabaddi season 6. His strong performance at the 2018 Asian Games and skill in strategy will be a huge boost for the team. Puneri Paltan stood first among Pro Kabaddi teams for most do-or-die raid points. Sandeep Narwal and Girish Ernak are two of the best corner defenders in Puneri Paltan. Sandeep Narwal was also the second most successful all-rounder of Season 5 with 85 points. Puneri Paltan’s star defender Girish Ernak has secured the highest tackle points in the team. 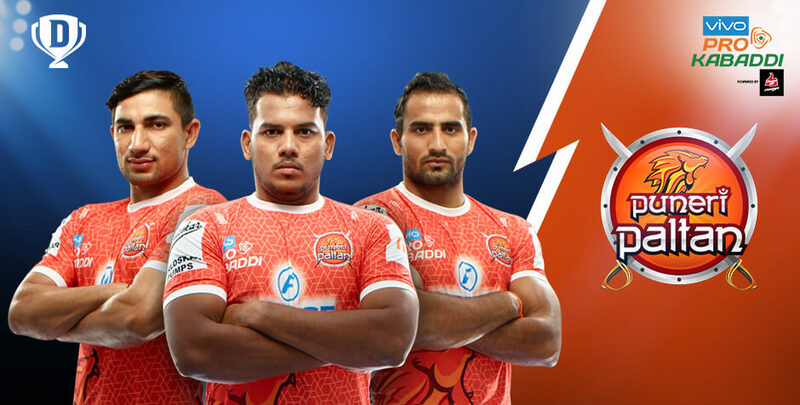 With the most effective defence of season 5, Puneri Paltan reached the eliminator by scoring 271 Tackle Points at an average of 11.29 Tackle Points per game. Nitin Tomar was the 8th highest point scorer in Season 5 with 177 points. There is never a dull moment in Puneri Paltan matches, and you can join in the spirit with your own strategy on Dream11. Sign up and get into the shoes of a team owner and make the calls! The Puneri Paltan schedule is packed with a line-up of many fantastic matches with incredible opponents. Challenge your friends and make your selections on the Dream11 website or play from anywhere using the Dream11 Mobile app. Invite your friends or play solo on Dream11 and get closer to the best online sporting experience. With the easy to play Dream11 platform, you can apply your sports acumen for some attractive winnings as you enjoy a Puneri Paltan match. So, sign up to Dream11 and experience how ProKabaddi matches just got to a new level of fun.